Exactly how many Washingtonians work for the federal government? The federal government remains the largest single employer in the Washington metropolitan area, and the District’s Office of Revenue Analysis is keeping track of exactly how many fed jobs there are. It's actually shrunk slightly over the past year. WASHINGTON — The federal government remains the largest single employer in the Washington metropolitan area, and the District’s Office of Revenue Analysis keeps track of how many fed jobs there are. The office’s monthly report said, as of November 2017, the federal government directly employed 364,000 people in the D.C. area. About 54 percent of those jobs were in the District itself. That number is actually down by about 4,200 jobs — or 1.1 percent — from November 2016. The federal government still accounts for slightly more than one out of every 10 jobs in the D.C. region. Local government employment is a close second, employing just shy of 341,000 people in the D.C. metro — up 2.8 percent from November 2016. While Uncle Sam is the largest single employer in the region, D.C. is a very white-collar town, with “professional, business and other services” the largest employer by industry. All told, 960,500 area jobs fall into that category. D.C. is also a tourism-driven town, and leisure and hospitality accounted for 331,100 jobs in the region as of November. The leisure and hospitality industry has added 9,500 jobs in the last year, a job growth rate of 3.0 percent. The biggest job growth in the region has been in the category of “education and health care,” employing 457,300 workers as of November — 15,900 more than a year earlier, or a 3.6 percent year-over-year increase. There were 6.5 million passengers at Reagan National, Dulles International and BWI Marshall in November. The biggest growth came at BWI Marshall, which accounted for 2.3 million passengers in November. That’s up 6.5 percent from a year earlier. 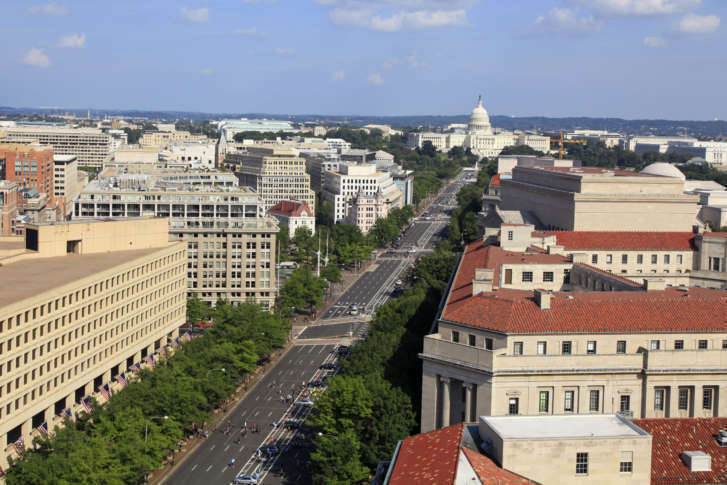 There were 31,450 hotel rooms available in the District in November. That’s up 1,305 from a year earlier, with occupancy up 2.4 percent. D.C.’s commercial office space vacancy rate in November was 9.7 percent, up 0.1 percent. The average price of a single-family home sale in D.C. in November was $764,900, up 1.4 percent from a year earlier. The average condo and cooperative sale in November was $535,400, up 8.6 percent. There were 15,170 rental apartments under construction and/or marketing in November, 18 percent more than a year earlier. There were 1,155 condos under construction or selling about the same as a year ago. 314 condos were sold in the District in November, up 11.3 percent from a year earlier.